Our mission is to give you and your family & friends insight into the honest and wholesome experience of farm life and the natural processes of providing food for the table, with all of its healthy benefits. Opportunities like participating in the cheese making process or feeding and milking the dairy cows are what we’d like to share with you. During winter months we will also take you on a sleigh ride through the backwoods, following sap lines and maple trails. We’ll end up where we started and enjoy fresh farm cookies and hot cocoa. During the summertime, we will offer hayrides and fresh Vermont maple ice cream. And on most holidays we will provide some special events for you to enjoy, so call (802) 768-8233 to check in often. Currently, we are under renovations, so all activities are on hold, but we welcome anyone who would like to stop by, buy raw milk, or hold a piglet or two. Our goal is to be Manchester’s top dairy cheese producer, and we can get there with your help. So stop by, join our page and on FaceBook. We milk a small herd of Jersey, Guernsey, and Holstein cows. Our cows spend their days grazing in our green pastures. They feed on hay produced by those same fields during the winter. They are happy and healthy and treated with the same respect that we give to our family. We believe in a system of sustainability that goes beyond organic, and farm like our great grandparents did. We fertilize with the best fertilizer ever made, and we do not have to buy bags of it in the store. Our cows never see GMO corn. We sell both cheese and raw milk on our farm. Our cows produce milk that is creamy, sweet, and delicious, and we are certified by the State of Vermont to sell raw milk from our farm. We also use that milk to make all of our cheese, and we use the strictest cleaning protocols to ensure that our milk and cheese is safe and sanitary. Our cheese maker will turn 100’s of gallons of milk a week into blocks of Gouda, Farmhouse, Wensleydale, and cheese curd, which is aged in our cheese cellar. Again, we are under renovations, and our goal is to be making cheese by February 2017. From our family and yours, enjoy! Wensleydale is a cheese with a rich history in the U.K, dating back to the mid 12th Century.. Once made only in Wensleydale by monks from sheep’s milk, it is now made all over England from cow’s milk as well. 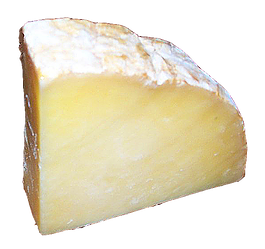 Wensleydale has a milky freshness and a touch of citrus when young. As it matures, the flavors become deeper with an almost honey-like flavor in the background. When mature, it is a crumbly cheese, but it becomes firmer as it ages. ​Serve with fruit and a nice crusty bread. Also pairs well with other cheeses. 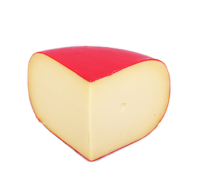 Named after the Dutch city it came from, Gouda varies greatly with age. Young gouda is typically consumed as a sandwich topping or snack, but aged gouda moves from a semi-hard to a hard cheese, as it develops crystals and caramel-like overtones. Serve with sliced apples and a light-bodied beer or a crisp white wine. Typically, this style was a specific reference to farmhouse cheddar, a cheese which made use of the best cream from the farm where the cheese was being produced. Thus, it was a special cheese and fetched a premium price. ​Now, especially in America, farmhouse style cheeses can refer to a wide variety of styles, as long as the cows, the milk, and the cheese are from the same farm. Curd flavor is mild, but can differ in taste depending on the process in which it was made. It has about the same firmness and density as a cheese round, but with a springy or rubbery texture. Fresh curds squeak against the teeth when bitten into, a defining characteristic not present in finished cheese, due to air trapped inside the porous material curd itself.